The mission of Student Affairs at Mount Aloysius College is to promote a physically and psychologically safe and secure institutional environment that supports the overall mission of the College while contributing to the holistic development of students both within and outside the classroom. Student Affairs is comprised of Athletics, Ann Harris Smith Little People’s Place, Counseling and Disability Services, Student Health Services, Orientation, Residence Life, Student Activities, Student Conduct, and Perkins Support Services. The staff supports and enhances the moral, cultural, religious and academic mission of the College by providing collaborative, lifelong learning opportunities that stress leadership development, student involvement, service to others, compassionate decision making, and responsibility to the campus and global communities. The Student Affairs staff strongly believes in the importance of treating others with respect, compassion, and genuine concern. The Student Affairs staff encourages students to become actively engaged in in-class and out-of-class educational experiences. The opportunity to interact with faculty, staff, and students of diverse backgrounds provides students the chance to learn more about themselves and the surrounding world. The professional staff from Student Affairs is available to support and encourage students’ personal and educational development. The Vice President for Student Affairs Offices, located in Cosgrave Center and the Athletic Convocation and Wellness Center, can help to answer any questions and make referrals to the appropriate campus or community resources. The College operates a state licensed child care center on campus. The Ann Harris Smith Little People’s Place serves students, staff, faculty and the local community. The primary mission is to provide a high quality, safe, nurturing learning environment that is affordable and convenient. A professional and student staff provides childcare for ages two to five. 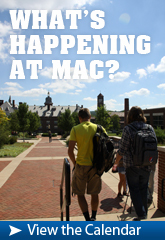 The center operates Monday through Friday during the fall and spring semesters. The daily schedule is designed to accommodate working parents. The center offers a structured preschool and toddler curriculum. Various academic programs utilize the center for required observations, service learning projects, and volunteer hours that enable students to complete course requirements. An active intercollegiate athletic program is an integral part of the educational process at Mount Aloysius College. Fifteen intercollegiate sports are sponsored by the College including baseball, men’s and women’s basketball, women’s bowling, men’s and women’s cross country; men’s and women’s golf, men’s and women’s soccer, women’s lacrose, softball, men’s and women’s tennis, and volleyball. 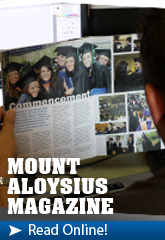 Mount Aloysius College competes as a Division III member of the National Collegiate Athletic Association (NCAA-III) and also as a member of the Allegheny Mountain Collegiate Conference (AMCC). A wide range of intramural activities and fitness activities are offered to students for enjoyment as well as improved physical and emotional health. Intramural activities include flag football, basketball, indoor soccer, volleyball, dodgeball, softball, ping-pong, bowling, and billiards. Fitness classes include Pilates, yoga, and indoor cycling. The Counseling Center is located in the Main Building, St. Joseph Hall. Licensed professional counselors provide consultations and short-term counseling. Services are confidential and are not noted on any student records. Appointments are available from 8:30 a.m. to 5:00 p.m., Monday through Friday. The most common issues discussed are stress management, family and relationship problems, self-esteem, depression, eating disorders, bereavement, domestic violence, and self-harm behaviors. Mount Aloysius College makes every reasonable effort to provide qualified students with disabilities the opportunity to take full advantage of programs, practices, services and facilities. Students with disabilities who wish to request an accommodation are required to do so through the Director of Counseling and Disability Services, St. Joseph’s Hall, Room 101, or call (814) 886-6515. At that time, students will be required to complete a formal request for accommodation and provide the necessary documentation. All requests should be submitted at least thirty (30) days prior to an effective date of implementation. The Director of Counseling and Disability Services will review the request, meet with the student, and determine what accommodations are warranted and will be approved. For any request for accommodations to be implemented, it must be formally approved. The College’s policy complies with the requirements of Title VII of the Civil Rights Act of 1964, Title IX and Section 504 of the Educational Amendments of 1972, and all other applicable Federal, State, and Local statutes, regulations, and guidelines. Life in a college residence hall is a unique experience. Studying, socializing, dining, and living with friends and peers provides students with chances to learn about themselves, to explore and formulate attitudes and values, and to develop their interpersonal skills. 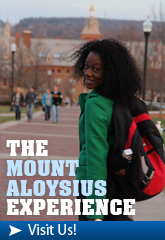 Mount Aloysius offers residents the opportunity to experience the benefits of living away from home in a college community. Residence hall living can be one of the best experiences of a student’s college career. As members of the resident community, students have greater opportunities to participate in educational and extra-curricular programs and activities. In order to protect the rights of all students while allowing for differences in lifestyles, regulations governing residence life have been outlined in the Mount Aloysius Student Handbook. Traditionally aged, full-time freshmen, sophomore, and junior students are required to live on campus unless the student is living with parents or legal guardian within a 45 minute commuting distance of the College. Except in unusual circumstances, priority for on-campus housing is offered to full-time students for the full academic year only. Resident students are required to participate in a resident meal plan. All resident students are required to complete a health form, provide a copy of their health insurance card, and submit the meningococcal verification form to the Student Health Services Office prior to moving into the residence halls. Fees for residence life can be found in the Tuition and Fees section of this catalog. The Belltower (Student Newspaper), Phi Theta Kappa National Honor Society, Delta Epsilon Sigma National Honor Society, Vox Nova, SALUTE National Honor Society for Veterans. The Bertschi Center sits just off the central red-brick walking mall that connects the Main Building westward toward the Library-adding access to Cosgrave Center and paths to two residence halls-Ihmsen and Misciagna along the way. It is a social and technology hub for both commuter and resident students. The facility is fully wireless with a wealth of outlets so students can plug in any and all types of electronic devices. Biology Club, Black Student Union, Bowling Club, Campus Activities Board, Cheerleading, Children’s Advocacy Association, Colleges Against Cancer (CAC), Comic Book Club, Criminology Club, CRU, Digital Grotto Group, Drama Club, Enactus, GSA, Interpreting Club, Information Technology Club, Legal Society, MAC Pep Band, MAC Dance Team Medical Assistant Club, Medical Imaging, Mount Aloysius College Political Awareness Coalition, National Society of Leadership and Success, Nursing Student Organization, Psychology Club, PTA Club, Resident Hall Association, SPSEA, Student Accounting Society, Student Athletic Advisory Club, Student Government Association, Student PSEA, Student Veterans Club, Surg Tech Club, Swimming Club, Women In Business. Students who wish to start a new club should contact the Student Activities Office in Cosgrave 110 and we will guide them through the process. For more information on club and organization involvement, stop by the Student Activities Office in Cosgrave Center 110. Commuting students are strongly encouraged to participate in student organizations and activities to enhance their marketability to employers as well as their personal development. The Commuter on the Go Club and the National Society of Leadership and Success are student organizations that promote commuter involvement and assist with matching students to activities that best suit individual interests and fit into the busy commuter schedule. The Student Activities Center is a popular outlet for socialization, recreation, and fun. Located on the lower level of Cosgrave Student Center, the SAC provides an opportunity to enjoy pool, ping-pong, foosball, air hockey, and television while relaxing between classes. There are numerous social activities for Mount students to enjoy throughout the school year. These include dances, plays, comedians, coffeehouse events, and a wide variety of novelty events. A variety of opportunities are provided for students to develop leadership skills. The Student Health Services Department provides services Monday-Friday 8:30 a.m. to 5:00 p.m. and is located in the Main Building, St. Joseph’s Hall, Rooms 100A-102. Quality health services for students are provided. Services include nursing assessment and treatment of minor illnesses and injuries. Non-prescription drug dispensing is available. Physician consultation is available at specific times. Community referrals and coordination of services are accessible. Health promotion and disease prevention activities are offered to respond to the broad range of student needs. The health services program is directed by a registered nurse with a local consultant physician. Confidential student health records are maintained. Health issues which are beyond the scope of Health Services are referred for further care and are subject to payment by the individual and/or insurance provider. All students are required to have a completed health form on file with Health Services including a physical exam and immunization record (Primary Polio series, Tetanus/Diphtheria vaccine within the past ten (10) years, Measles, Mumps, Rubella, and Varicella). Students who live on campus must receive the meningococcal vaccine or sign a waiver according to the Pennsylvania College and University Act of July 2002 (Senate Bill 955). Nursing and Health Studies majors have additional health requirements including a Hepatitis B series and titers (labs drawn) to determine immunity for Rubella, Ruboela, Mumps, and Varicella. Resident students and athletes must have health insurance and provide Health Services with a copy of their card to keep on file. CPR certification courses are provided. Nursing and Health Studies majors are required to have Basic Life Support Professional Rescuer CPR certification.